In a vote today, the Canadian Parliament voted to keep debate on Bill C-311 alive. The vote was 155-137. This is good news, though the bill likely faces an uncertain future even if it passes parliament, thanks to Canada’s nominated and recently conservative majority senate. It was heartening to see the liberals vote en masse in favour of realistic targets. I am also attaching in verbatim, an email received from Michael Ignatieff’s office this morning on the bill. On behalf of Michael Ignatieff, I would like to acknowledge receipt of your recent email regarding Bill C-311, The Climate Change Accountability Act. Mr. Harper is isolated on the environment – he’s behind the provinces and our peer countries when it comes to taking leadership on climate change and the environment, and has undermined international progress at every turn. The Liberals are taking the Harper Conservatives to task over their failure to commit to a principled environmental policy backed up by real action. We’re calling on the government to immediately put in place a national climate change plan with economy-wide regulations on emissions and strategic investments in renewable and clean energy. Michael Ignatieff and the Liberal Party are also supporting Bill C-311 as part of our staunch opposition to Mr. Harper’s laissez-faire approach to the environment and climate change. We support its central principle – that Canada needs to take immediate, ambitious action to get us back on track to reducing emissions and improving our renewable energy sources. We must be clear, however: Bill C-311 is not a climate change plan. It picks targets, but it does not lay out a plan on how Canada can reach those targets. That’s where it comes up short. The Liberal Party has put forward a credible, achievable climate and clean energy strategy that will create jobs and make our economy – and our country – one of the cleanest and most competitive in the world. Canada cannot afford to miss this opportunity. Thank you for taking the time to write the office of Michael Ignatieff on this important issue. Bill C-311, Canada’s Climate Change Accountability Act, is back in the “news” (no silly, not the media, who have more important things to worry about). I had written about this before the Copenhagen meeting. This bill sets Canada up with greenhouse gas emission reduction targets that would put Canada in a respectable mainstream position, 25% below 1990 levels by 2020, 80% below 1990 levels by 2050. But the Conservatives, in one of their classic legislative gambits, have forwarded the vote for April 14th, Wednesday. If the bill doesn’t pass here, it’s dead, and 4 years of countless committee readings, and multiple votes to pass would be wasted. And Canada will not have any climate change legislation whatsoever. Serious business, isn’t it? Climate Action has more, including what you need to do (I know, short notice, that’s apparently how important decisions get made around here). The Liberals hold the key. It was they who voted with the Conservatives the last time to scuttle the pre-Copenhagen vote. As of writing this post, no official word from the Liberals on their position. A call to Michael Ignatieff’s office, (613) 995-9364 gives me little hope of passage. I was told that the MPs had met, that Mr. Ignatieff would not be voting (apparently, because it’s a private member’s bill, leaders don’t vote, weird). Also, the official position of the party is that because it is a private member’s bill, that every MP would be free to vote on their “conscience”. Given that the Liberal party could not even defend women’s health in a recent whipped vote, I wonder where their conscience is on this. A call to David McGuinty’s (the Liberal Environmental Critic) Office, (613) 992-3269, elicited the rather helpful response that they would not be commenting on their stand till after the vote. Of our local MPs, both Denise Savoie (NDP) and Dr. Keith Martin (Liberal) will be voting to preserve the bill, they are on record saying this at a forum on climate change last week. Of course, Gary Lunn (Conservative) is not part of the equation here, pointless. So, call, call and call away, the Liberals need to hear about this. They don’t appear to understand the most basic rule of opposition politics, you get no points for supporting the government, except from pundits in the mainstream media. Only if you inflict some defeats on the government will the people of Canada take you seriously. As always, remember that it is the Liberals that will be blamed for this bill’s demise, we all know the Conservative position on climate change. The NDP and Bloc Quebecois have voted repeatedly to pass this legislation. It is Michael Ignatieff’s Liberals who will stand in the way of Canada’s environmental progress. Paul Krugman takes on climate change economics, just read the whole damn thing, but I will summarize so you don’t have to wade through 8 pages. In what follows, I will offer a brief survey of the economics of climate change or, more precisely, the economics of lessening climate change. I’ll try to lay out the areas of broad agreement as well as those that remain in major dispute. First, though, a primer in the basic economics of environmental protection. Magazine Preview – Climate Change – Building a Green Economy – NYTimes.com. First off, it is well written, aimed at simplifying the economics of pollution so most people can understand, what you’d expect from him! He compares the costs of action to the costs of inaction, no surprise that the costs of inaction are orders of magnitude larger than the costs of action. Of course, he ends with the caveat that the political will to do this is going to be sorely lacking. What do I think? While it pretty much encapsulates what I think of as the big picture approach, Krugman hand waves around the many personal changes in consumption, land use, urbanization, localization that all have to occur. All of that is included in “additional command control based changes”. I don’t necessarily believe in Homo Economicus, the rational human who responds to economic incentives. So we will have to, as citizens, agitate forcefully for local actions that set us in the western world up for reduced consumption and increased efficiency. In addition, we have to simultaneously support national level politicians that are serious about climate change and punish the ones that are not, so they can help enact the right national and trans-national policies. Anyway, all in all, an excellent read. The enormity of climate change and its impact is on everyone’s lips in this cold desert where over 80 per cent of the farmers depend on the snow melt for their needs. Water is almost a luxury now. 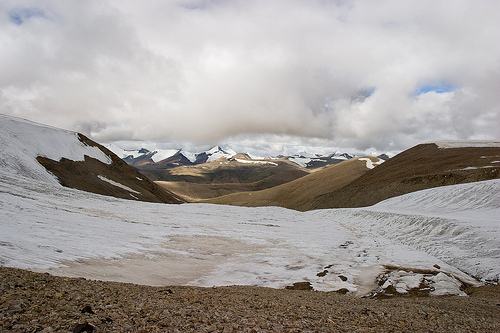 There is no authoritative study done so far to estimate the impact of receding glaciers in Ladakh, points out Ms Nisa Khatoon, project officer, of the World Wide Fund for Nature (WWF) in Leh. Scarcity of water has led to people digging bore wells in Leh, which is likely to have an impact on the underwater springs. Ms Khatoon also notes a reduction in pasture lands affecting the migration routes of the Changpas, a nomadic tribe that lives near the lakes in the upper reaches of Ladakh. The Hindu : Opinion / Op-Ed : The glacier melt. I seem to remember a certain Environment minister claiming that climate change mitigation policies were irresponsible because they would lead to a small drop in GDP growth in his country. If only the people of Ladakh had this luxury. Believers in reincarnation may wish that Mr Prentice be reborn as a farmer in Ladakh circa 2060, but there may not be any farmers in Ladakh come 2050, nor any glaciers, so I guess that would make him a lonely man! “The conclusions [the report] draws are irresponsible,” said Mr. Prentice in an interview with The Globe and Mail from Kingston, where he was meeting with provincial and territorial environment ministers. Specifically, he said Canadians will not accept the report’s advocacy of emission targets for 2020 that would reduce Canada’s gross domestic product by 3 per cent nationally and 12 per cent in Alberta from business-as-usual estimates. Climate change report ‘irresponsible,’ Prentice says – The Globe and Mail. Canada cannot take its national unity for granted and must not, in the service of international obligations, allow itself to be immolated by a government policy of such wrenching dislocation. Wow, “irresponsible”, “Threat to Canada’s National Unity?” What could we talking about? Surely, not a report that addresses the cost of meeting Canada’s commitments to greenhouse gas reductions by 2020?. A bit of hyperbole from this nation’s great flagship newspaper and the Environment Minister? The study (English summary) looked at two different scenarios, first the weak sauce 20% reduction from 2006 levels by 2020 proposed by the Canadian government. The reason the Canadian government deliberately shifted the baseline from 1990 (the accepted consensus baseline so comparison can be made easily) to 2006 is that if you calculate what the change from 1990 levels is for the Canadian government proposal, it is actually a small increase, not the 20-25% decrease that is needed to put the world on a stabilization path for <2°C rise in temperature. This is unethical and dishonest, like telling the world that the average Canadian is 4 feet tall (head to knee only). The authors of the report know this is an unacceptably weak proposal and therefore looked at what was actually needed, a 20-25% reduction from 1990 levels. BTW, remember that if someone ever shoots a percentage off for you, ask for the baseline, check if this is standard. The effect on Canadian GDP growth is modest. Under the required goal of 25% reduction from 1990, GDP growth is about 3% below “business as usual” standards. Note that this year, GDP growth was negative, what percent is that? Of course, the environmental, social and geopolitical costs of “doing nothing” are not enumerated. Are we prepared to face a world with melting polar ice caps, climate refugees, water wars and anger? Are we willing to take those Canadian flags off our backpacks and put Swedish flags on them? There is also a very good chance of incremental breakthroughs in electric vehicle technologies squeezing the demand out of oil and completely collapsing Alberta’s economy, making this entire decision moot. Things can change quickly, just ask anyone involved in the BC timber industry! My point is that unless you factor in the costs of doing business as usual, any change proposed will not compare favourably. The report alludes to the cost of doing business as usual, a 5-20% LOSS in global GDP over the century. But does not include this into the calculation of the business as usual scenario. Note that none of the changes envisaged here propose anything but “growth”. The changes required are quite significant. Replacement of fossil fuels by cleaner electricity (e.g., for heating buildings). When you are near the bottom of the pack when it comes to efficiency and per capita emissions, you do necessarily have to work a little harder. Most of these goals (except the first one which needs a major technological advance) are easily achievable and would put Canada more in line with European countries as far as energy efficiency goes. What do the words of the mainstream media and the government mean? We are screwed. Canada has NO leadership or commitment to steer away from the cliff. We do not have a powerful enough constituency for climate change. We have a government and polity completely captured by oil interests. We will be dragged kicking, screaming and unprepared into a new, efficient and carbon constrained world. We may still turn out okay because we are a VERY rich country with very few people. But, be prepared for the backlash. Note, more from the excellent blog greenpolicyprof ‘which makes some of the same points I made, but expands to include coverage of West vs. the Rest issues. Victoria350.org is a collaboration of numerous community groups who are coming together to host FutureFest Victoria, a celebration to raise awareness around the number 350. There will be a kids corner with crafts, an art-based community visioning space, main stage music, a flash dance mob, local non-profit and community business tables, organic produce and coffee, topped off with a 350 bike ride downtown. Bring the whole family and come down for a fun and meaningful afternoon. All are welcome! via FutureFest Victoria | 350.org. FYI, the Victoria event is at Centennial Square tomorrow from 12-4. That’s the argument from a new paper published in Science today, written by Princeton University’s Tim Searchinger and others. The upshot? Clearing out forests to use the wood for bioenergy clearly has an environmental cost, but that’s simply not accounted for in any of the prevailing climate-change programs. Kyoto, the European cap-and-trade plan, and the House climate bill all treat bioenergy as carbon-neutral; nobody counts the effect of disappearing forests. In my long blog post earlier this morning, I briefly alluded to the fact that proposed Canadian climate change legislation explicitly excludes land use. Well, bad idea! I am surprised this is being trumpeted as a major new finding, hasn’t it been obvious for at least the last few years that biofuel carbon neutrality is very dependent on how land use patterns change? “We need to hear more about the American position, the European position, the Chinese position” before considering the bill, McGuinty told CBC News. With that rather weasely statement, Canada’s Liberal Party signalled that it will support a further delay in a vote that would set realistic limits on Canada’s Greenhouse gas emissions. I was too angry yesterday to write a decent post about it, but hey, as my partner often says, “Anger is a positive emotion”. So, here goes. 25% below 1990 levels by 2020, 80% below 1990 levels by 2050. This is in line with IPCC recommendations (pdf) (See page 776, thanks Climate Progress) to stabilize temperature rise to < 2°C and GHG concentrations to 450 ppm CO2 eq. Hansen, other prominent scientists and activists at 350.org have a more ambitious target in mind, 350 ppm. In comparison, proposed legislation by John Kerry and Barbara Boxer in the US senate would reduce GHG emissions by 20% from 1990 levels, and 80% by 2050. So, this bill proposes targets that are in line with what the world’s greatest polluter (per capita, historical) is proposing and current official consensus. There is a lot of small print in the exemptions, agriculture is a big one on the US side and land use and forestry appear to be a rather significant omission on the Canadian side. Bottom Line: The targets are exactly what is recommended by the IPCC, are reasonable and in line with what our biggest trading partner has proposed. They need to be strengthened in the near future, but are good for now. It does not establish a mechanism to bring about these reductions, only specifies that the government come up with scientifically sound interim targets and an emissions reduction regulatory strategy, be it emissions trading, or carbon taxes, etc. That’s fine, given Canada’s balance of powers and separation of province-federal powers, it would be best for an executive approach to regulation writing. Bill C-311 is not new. An identical version passed the House of Commons in 2008 and was stymied by an election call. Since Canada has a bicameral legislature, the bill needed to be passed by the Canadian Senate as well and the election blocked this vote. Right now, it needs a vote to get out of committee and on the floor of the House. Well, the NDP wanted to get the bill out for vote. The Bloc Quebecois supported them. The Conservatives, in a delaying tactic, wanted to extend the committee study period for another month, citing a “need for more expert testimony”, the Liberals agreed with them and the bill is stalled for now. Why? It is all politics. This is where the story gets interesting, and epitomizes everything that is wrong with Canada’s current political system! Canada is currently (since 2006 and 2 elections on), run by a minority Conservative government. Minority governments work very differently in Canada compared with typical parliamentary democracies such as India, Israel, etc. There are no coalitions, no alliances, especially now since the Conservative party is well to the right of every other party in Parliament. Canada has four other prominent parties, the Liberals, a centrist, business friendly party that has previously governed, the NDP, a left leaning union friendly party, the Green party, an environmental issues and good governance driven party (no seats in parliament), and the Bloc Quebecois, a regional party based in Quebec which wins seats only in Quebec. For the Conservative party to pass legislation, they need the support of one other party. Of course, to stymie legislation, they can use various parliamentary procedures. This is why C-311 is a private member’s bill, the government, which is vehemently opposed to any meaningful climate change mitigation regulation, would not bring something like this up for vote. The NDP would like to be responsible for meaningful regulation on climate change as it is in line with their stated principles and also neatly aligns with their desire to be seen as a serious opposition party, and as a party capable of governing at the federal level. The Liberals, well, they ran their last election on a radical restructuring of the Canadian tax system called the Green Shift. This envisaged a reduction in personal income taxes combined with the establishment of a carbon tax. The Liberals lost the election, and have been a lot more cautious about bringing up environmental issues. I happen to believe that the loss was primarily due to poor election strategy, a leader with the charisma of a freshly painted wall, and a flawed electoral system that allows for too much vote splitting, “wasted” votes and is unrepresentative. But, the media has run with the “it must be the environment” meme, and currently view any environmental legislation as a vote loser. This is in direct contradiction with polling data (pdf) that indicates the opposite to be true. Unfortunately, the price for success against the government in this half-assed minority government situation is likely an election! Opinion polls indicate that an election held today would likely result in very much the same situation as the last time around, maybe even an increased near majority for the Conservatives. 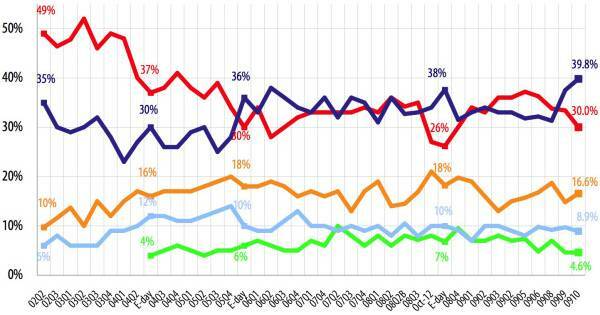 The Conservatives (in blue) have a solid lead over the Liberals (Red) and the NDP (in orange) apparently have a 20% ceiling. In a normal parliamentary system, this would mean an alliance between the NDP and Liberals to win the election pretty handily (note that the votes would not additive, but there is a conservative vote ceiling around 40%). But as long as electoral reform is off the table, and the extremely hidebound Canadian mainstream media does nothing other than bemoan the lack of electoral participation while roundly condemning any alternative that would increase such participation, we are stuck with ths situation in which a Conservative government takes this country slowly rightward where it really does not want to be taken, given that solid majorities are against said conservative policies. Canada dithers again on climate change. To the core supporters of the Conservative party, this is as should be. However, for the majority of the country, for the international reputation of the country, and for the political system as a whole, this is an unacceptable delay. The Liberals win no friends by being indecisive and showing no leadership. The NDP is stuck with no amount of “responsible” opposition work giving it any traction in the polls, the political intelligentsia of Canada would not accept an NDP ascendancy. The political system does not reward cooperation. So, we remain stuck, a country of many beautiful words and very little action. 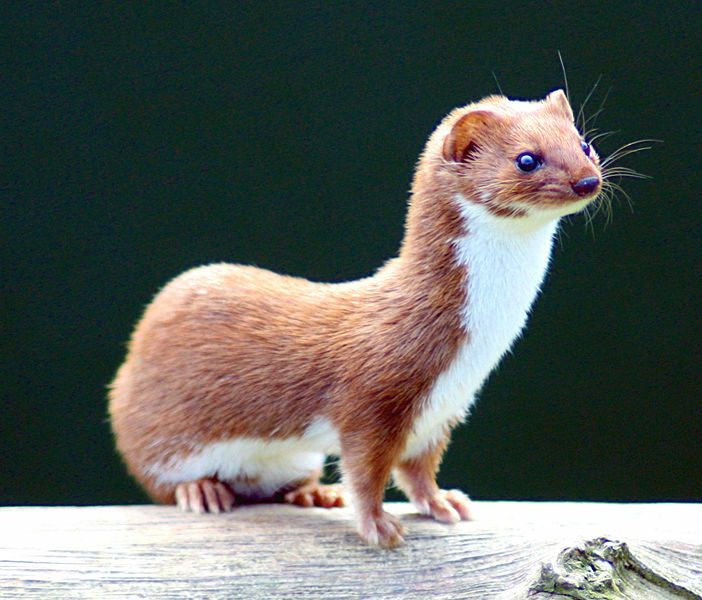 * – I like weasels! The Obama administration is hoping to win new commitments to fight global warming from China and India in back-to-back summits next month, the Guardian has learned, including the first Indian emissions trading scheme. The US hopes the new commitments will breathe life into the moribund negotiations to seal a global treaty on climate change in Copenhagen in December, by setting out what action each country will take. But many observers say such bilateral deals also risk seriously weakening any Copenhagen agreement by allowing the idea of a global limit on greenhouse gas emissions to be abandoned. So, as part of Blog Action Day 2009, which is focusing on climate change, I bring you news that the US administration is back, taking some kind of a leadership role in climate change by talking to India and China. The notion that somehow what the US, Europe and Canada do in response to climate change is pointless because China and India are not going to participate is misleadingly inaccurate, sometimes deliberately so. I had written in June about India’s very ambitious solar policy, and China has similar, fairly comprehensive programs on climate change. The concern that bilateral talks will somehow sabotage the multilateral Copenhagen negotiations is, I think, overstated. More talk is always better, and good things happen when the world’s most high profile polluter signals its willingness to talk, and even initiate talks with countries whose development paths are at a critical stage. I have not been super hopeful about how things are going to turn out in the next few years. But things have changed quite a bit in the past year. The US appear to have their own climate bill brewing. Europe makes the right noises and has a head start,making the mistakes early. Unfortunately, Canada has given up the ghost thanks to our troglodyte oil man administration. Our main hope now is that the US passes a strong enough bill to affect Canada. Or there is an election leading to a change in administration and Mr Michael Ignatieff and the “liberals” are true to their word on a new, sustainable energy policy. Canada is now the worst laggard, having extremely high per capita emissions and policy to increase these emissions while actively sabotaging climate talks. We emit a full 2% of all global warming contributors while accounting for about 0.5% of the world’s population. It is understandable given our development path how we got there, but not trying to fix it is criminally negligent and morally bankrupt. Apparently, the Canadian people could care less, polls indicate that the business as usual administration is increasing its support among Canadians. What is the average Canadian’s responsibility if he/she knowingly supports policy that could lead to mass homelessness, flooding, starvation, wars, species extinction, etc? On Climate blog action day, I am sad to report that my adoptive country will do nothing but soldier on in its destructive behaviour. No point calling my local MP, she agrees with me!